A “pass” for the dual drum 3-sided impact compactor is defined as two runs of the compactor over a 4 meter wide lane such that one drum of the compactor during its second run travels in the middle of the inter-drum space created by the first run of the run of the compactor. Overlapping of drum paths in two consecutive runs (i.e. in one pass) will not be permitted. Note that these are guidelines only and production is dependent on material type and condition. Although these predominantly refer to the driving of piles, vibratory equipment and/or blasting, they do serve as a great guideline for the industry. Although vibrations are very dependent on the material characteristics/properties and the effect of the vibrations on adjacent structures is very much a factor of the structure itself (building material, foundation type, age, etc), it is very rare that an IMPACT COMPACTOR will generate anything beyond 15mm/s (0.6 in/s). Much of the "fear" is a perception due to the impact on the surface but, according to the governing standards and specifications, very little to no damage will generally be created through the use of an impact compactor. If there is fear that the effects are greater than one would prefer, then most of the effects can be mitigated by digging a trench between the path of the roller and the structure in question. 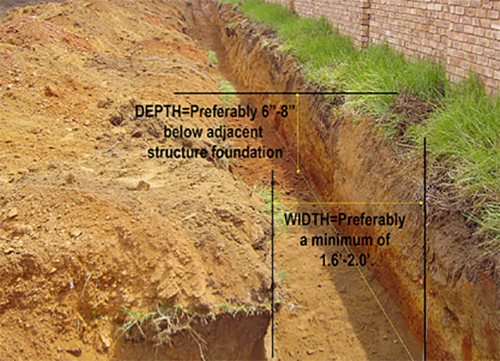 It is preferable to have the trench dug a little deeper than the foundation depth of the structure in question and, generally, no wider than 500mm (20 in) would be necessary. In this way, the vibration waves would not propagate through the trench, reducing the effects dramatically. The noise levels created by construction equipment will vary greatly depending on factors such as the type of equipment, the specific model, the operation being performed, and the condition of the equipment. The equivalent sound level of the construction activity also depends on the fraction of time that the equipment is operated over the time period of construction. The general guideline, although this may differ from state to state or country to country, is to maintain noise levels in a residential area to 90DBA and in Commercial and Industrial areas to 100dBA. This reduces to 80dBA for a residential area but remains unchanged at 100dBA for Commercial and Industrial areas. Generally an Impact Compactor, towed by an agricultural tractor of no less than 400hp, would have a typical noise level of 78-84dBA. The Federal Highway Administration (FHWA) suggests a method for estimating the construction noise levels and although associated with the construction of a highway, it can be used as a guideline for any project. Differential settlement is basically defined as the uneven downward movement of a structure caused by uneven settling of the material (soil) under dynamic load. This can be either or a combination of an uneven structural load or poorly and unevenly compacted material resulting in uneven settlements and, ultimately, resulting in structural deficiencies or complete failures. At least two components of settlement are required to be evaluated: primary settlement and secondary settlement. 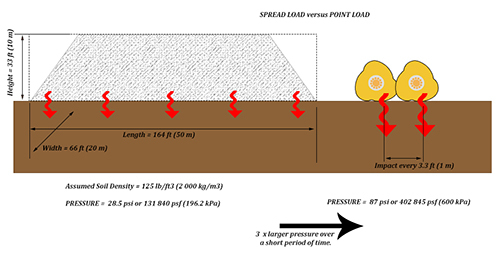 Primary settlement can be mitigated to a higher extent by inducing as much settlement as possible during the compaction process and if the rate of settlement reduces to an absolute minimum with an increase in the compactive effort, it would be generally acceptable to agree that no further settlement would be possible if the dynamic loads were not increased beyond that imparted by the compactive effort. Secondary settlement is almost impossible to eliminate during a normal compaction process as secondary settlement generally refers to creep that can happen at any time post construction. The only way to mitigate against this potentially negative effect is to design the foundation to be able to withstand a reasonable amount of settlement after construction. Heavy load compaction through high energy impact compaction will greatly assist in (1) inducing the maximum amount of settlement and (2) mitigating against the negatives associated with differential settlement by potentially eliminating the primary settlement across the entire site. Due to the natural variability in soils and changes in the vertical stress across a facility, settlement characteristics and the amount of settlement are likely to be different from one point to another across a site. 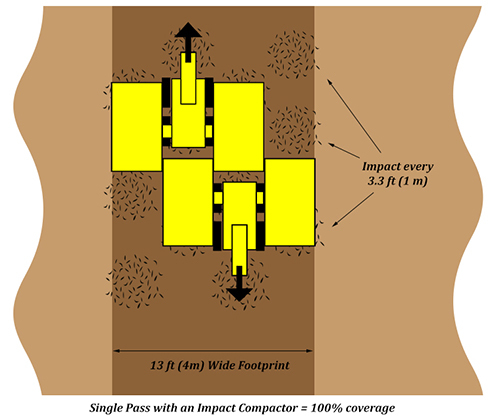 The “single point” impact of a high energy impact compactor, together with 100% coverage of the site, will allow for variable settlement (unlike the “bridging” effect that may potentially be experience with a smooth drum roller) across the site and will easily highlight excessive settlement sections that can be identified as potentially hazard and thus requiring isolated remediation. A surcharge load is any load which is imposed upon the surface of the soil close enough to the excavation to cause a lateral pressure to act on the system in addition to the basic earth pressure. Once sufficient consolidation has taken place, the load is removed and construction may commence. A substantial amount of settlement can be achieved over time. Easily placed by the main contractor. Successfully used in clays, as long as a drainage “blanket” is used or vertical drains are placed to allow the excess pore pressures to dissipate. If the load is left in place for a substantially long period, it will have the advantage of possibly being able to treat some of the secondary settlement that would be experienced under dynamic loading over time. 100% coverage of the site. Requires a substantial amount of fill, typically 10-15 feet thick, to be brought in. Surcharge fill must extend horizontally at least 33 feet (10 m) beyond the perimeter of the planned construction, which may not often be possible. The surcharge must remain in place for a lengthy period of time, which can extend to several months, thus delaying the construction works. If secondary consolidation needs to be addressed, such time may be pro-longed even further. Ultimately, since there is no real time period set (or pre-determined) so as to ensure removal of secondary consolidation, the expectation of total removal is not measureable and thus unknown. Testing and verification is generally performed on a very wide conventional testing grid. High Load Compaction is more of a “point” load as opposed to a distributed load over a larger area. The “point” loads (high loads over a small area) are substantially higher than a distributed load (large loads over a larger area). These high loads are traditionally a lot higher than those experienced post construction, but they may not have the opportunity to inducing settlement that may be a result of secondary settlement over time. This process is a lot quicker thus only essentially resulting in primary consolidation. “Point” compaction inducing high loads over a small area. Method of effectively inducing maximum primary consolidation. For comparison purposes and to highlight the two points above, the following example is offered. Depth of influence of averaging 6.5 feet but probable increase by increasing in the number if impact passes. Vertical drains can also be installed to allow the excess pore pressures to dissipate. High loads applied in a very short time period. Verification of the improvement achieved through the use of the Continuous Impact Response (CIR) measurement system; testing on a very tight grid with almost 100% site verification. Depth of influence not as deep as surcharging. Watering and grading required during the compaction process.